Ballfinger launches plush reel-to-reel tape machine and turntable | What Hi-Fi? Both combine retro tech with a stunningly modern design aesthetic. 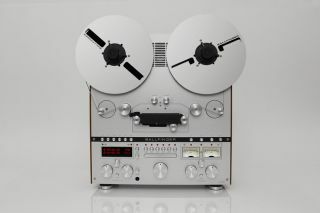 What a week it's been for fans of retro audio gear - just days ago, we brought you news of this cracking piece of ex-broadcast studio gear cropping up on eBay, and now we have a stunning new reel-to-reel tape machine and turntable to pore over. Both are made by the interestingly named German brand Ballfinger (whose name we can't help but sing to the tune to Shirley Bassey's Goldfinger). They were first spotted by AVHub. First up is the Tonbandmaschine M 063 reel-to-reel tape machine. Ballfinger's background is in stylish objects such as anglepoise lamps and wristwatches, but it's clearly taking its plunge into the world of hi-fi seriously - so seriously, indeed, that it has manufactured all the components, including drive motors, servo units and pick-up systems, itself in its own factories. Given the company's design credentials, it's hardly surprising the M 063 is aimed at industry professionals (though it's also suitable for "the ambitious music lover"). It packs a three-motor drive that runs at 7.5 or 15in per second, and takes up to 12in tape reels. It also runs nigh-on silently, even in fast rewind 'archive' mode, thanks to tacho-controlled winding speeds and a processor-controlled drive which keeps the tape taut, preventing any stretching or forming of loops. There's also a digital counter on hand for precise readouts. The turntable is named Schallplattenspieler PS 2, and is described as a "directly driven record player with active radial arm and moving coil system." It claims to be the first record player whose radial arm has been combined with a processor-controlled linear guide. This makes for a completely straight tone arm "without skating force and tracking angle". The short manual hold and plate drive also remain stationary during the plate change - just tap it to set it moving again. It should be super accurate too, with two microprocessors operating independently of each other, with a chip constantly comparing the disk speed with the desired speed and keeping things in check. Both the record deck and tape machine were unveiled at German hi-fi show Norddeutsche Hifi Tage. As you might imagine, this kind of gear doesn't come cheap. The M 063 is said to cost €27,000 (£23,000). We've contacted Ballfinger for UK prices and availability, and will update this story when we hear back.